Vladimir Ashkenazy, Sydney Symphony. Exton HQ SACD EXCL-00042. 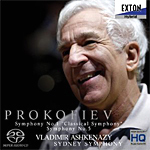 Pianist and conductor Vladimir Ashkenazy and the Sydney Symphony impressed me greatly with their Exton recording of Prokofiev's Lieutenant Kije Suite, so there was no reason to suspect anything less from their recording of the composer's two most-popular symphonies. Neither the conductor nor the orchestra disappointed me. Russian composer, conductor, and pianist Sergei Prokofiev (1891-1953) wrote his Symphony No. 1 "Classical" in 1917 and premiered it in 1918, just before he left Russia for America, fearing his music was too radical for the new Bolshevik regime. He called it his "Classical Symphony" because he said he based it loosely on the style on Joseph Haydn, though with modern touches. Judging by the number of current recordings, it looks as though the First Symphony just edges out the Fifth by a nose. But I gave up counting the various recordings after the first few hundred listed. In any case, audiences love both works, and with the First, one can easily tell why. In the Symphony No. 1 Ashkenazy gives us a rather zippy account of the first movement; it's a lively, cheerful work, and that's the way the conductor sees it. The classicism of the symphony was also probably Prokofiev's way of rebelling against the overt Romanticism of the previous century and getting back to simpler models. Ashkenazy seems to have the most fun with the third-movement Gavotte, a dance form that even predates Haydn. Then the conductor leads us on a merry chase through the Finale, one worthy of a Warner Bros. Road Runner cartoon. Ashkenazy understands that Prokofiev was being playful in this music and accords it appropriate care. The performance hasn't quite the grace or charm of Sir Neville Marriner's old Decca-Argo recording with the Academy of St. Martin-in-the-Fields; still it's fun. As I say, next to his First Symphony, Prokofiev's Fifth Symphony, from 1944, is one the public probably likes second best of his seven symphonies. It's about as opposite the "Classical Symphony" as possible in tone, although there continue to be similarities. The composer wrote the Fifth while he was living back in the U.S.S.R., yet even though it was toward the end of World War II, the symphony is not a "War" piece in the sense of a Shostakovich symphony. In fact, Prokofiev made sure his symphony sounded rather modest and lyrical, making it not only accessible but one of the few works of the time the Soviet government never condemned as dissonant or corrupt. This, of course, Prokofiev intended as an irony. Prokofiev later wrote that in the Fifth Symphony he "wanted to sing of the free, happy man, his mighty power, his chivalry and his purity of spirit," all of which he meant both seriously and as a sarcasm directed toward the repressionist Stalin regime. Ashkenazy provides the work with a dark shadow hanging over much of it, which seems only right and fitting. Anyway, the composer called the piece his response to the turmoil of World War II. As such, it opens with the anguish of that nightmare, followed by a caustic second-movement Allegro, with hints of his Romeo and Juliet, in which the conductor maintains the composer's rhythmic lift enthusiastically. The long, slow Adagio demonstrates a brooding intensity, with Ashkenazy imparting an proper dynamic thrust; and the concluding movement ends the work in a kind of mock triumph. Both the sound and the performance reminded me of Paavo Jarvi's account with the Cincinnati Symphony on Telarc, and choice between those two, at least, might come down to the different couplings. Recorded "live and in session" in 2009 and transferred to a hybrid HQ CD/SACD, the sound appears fairly close, yet without losing too much depth or hall ambience in the two-channel SACD layer I listened to. There is a fine, warm clarity throughout, good transient impact, and a wide stereo spread. There is also a goodly amount of separation among the instruments without the recording seeming compartmentalized or over-miked. Nevertheless, despite the closeness of the microphones, the sound is never bright, hard, or edgy, either, making for a most-relaxed and realistic presentation.